It was the first day of Chinese New Year and we did not have a lot of things left to do in our itinerary. We decided to relax, enjoying the hotel while packing our stuffs. At around 10 we left the hotel for a last minute walk around George Town. We wanted to visit The Blue Mansion but well, it was closed for the New Year celebration. Almost everything was closed that day! The city was like a dead zone.. hahaha. 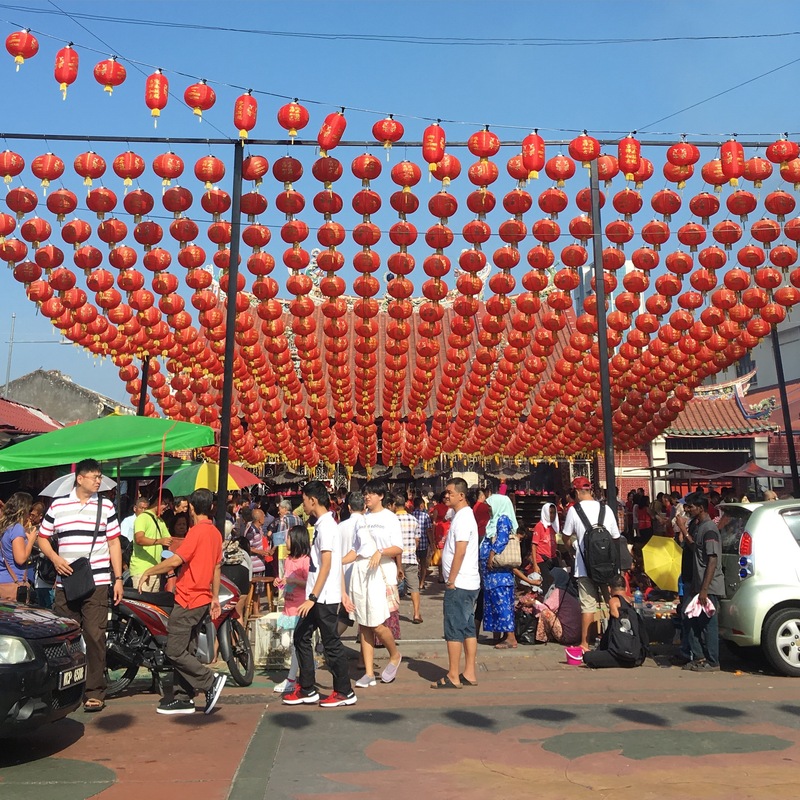 After my experience I think the best time to visit Penang is around Chinese New Year period. That way you’ll get to see how pretty the city is with all the lights.. but it’s better to stay a couple days after the New Year, so you can still enjoy business as usual. In fact, while most people are staying at home with their families during the first day of New Year, the public celebration normally starts a week after, and I heard it’s going to get even more festive! Okay back to my story. 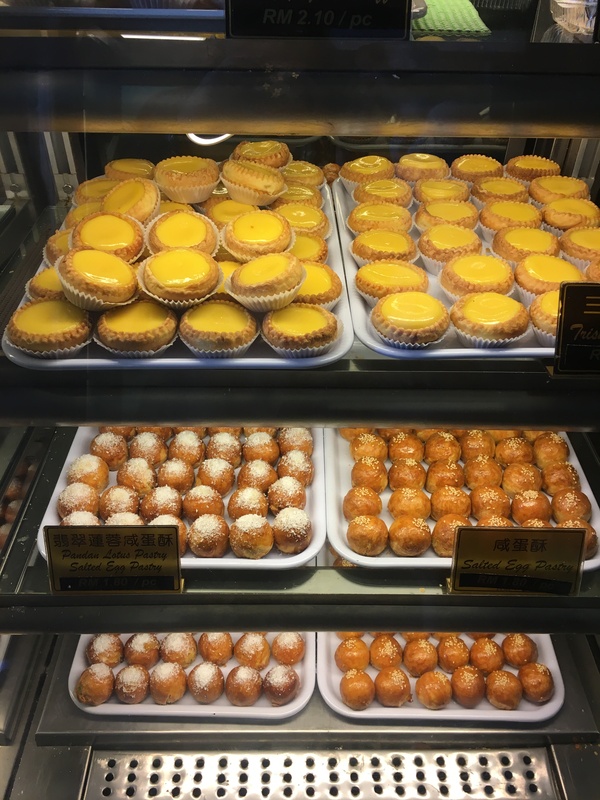 After the failed Blue Mansion visit we went to Ming Xiang Tai – a local bakery famous for its yummy pastries. We tried their Kaya Puff, Salted Egg Pastry, and also Egg Tart. All delicious, but my favorite was the Kaya Puff! I like it so much I decided to buy some to bring home. 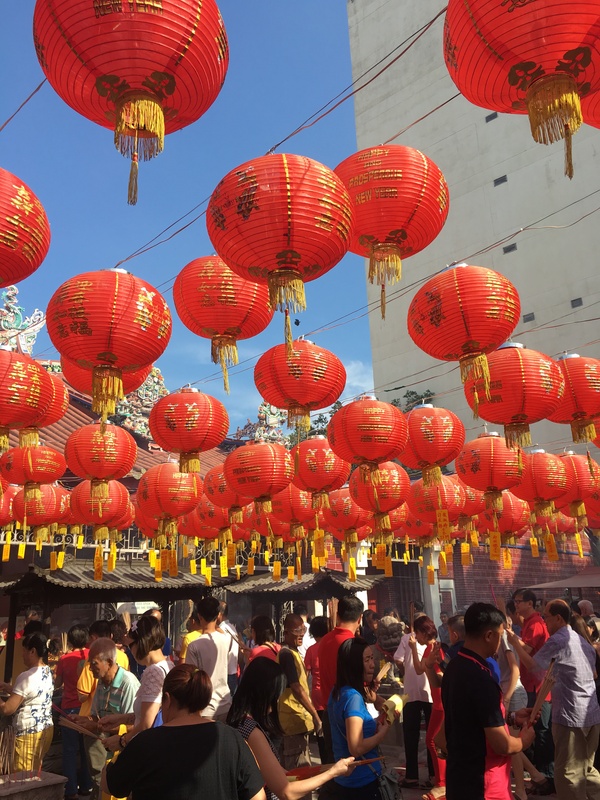 While on our way to Ming Xiang Tai, we passed by a temple and it was so festive, a lot of people were there and most of them were wearing red. We saw people on the streets wearing red too; I think they were on their way to visit their families. The atmosphere was somewhat similar to Lebaran atmosphere in Jakarta. Before we knew it, it was lunch time. We knew that Indian restaurants were most probably open, but we tried to avoid it because we wanted to try Malay/Peranakan food. We did found one, but guess what… it was Old Town Kopitiam! Hahaha not special at all, because we can actually find their branches in Jakarta. Well, there wasn’t much choices. Lucky that it turned out to be delicious, even better than the one in Jakarta, I think. After lunch we went back to the hotel, checked out, and went to the airport. So that’s how my weekend in Penang went. Though short, it was memorable and Penang now is definitely in one of my ‘places to-come-back’ list! Yeah, the problem with going somewhere during a holiday which the people do celebrate (with their closed friends/families) indeed: much less is going on during the time, haha. In a sense it is similar with how Rome is during Christmas 😛 . Actually it’s my second time traveling during a big holiday Ko (gak kapok2 hahaha), I started my UK road trip right on christmas eve. We reached Liverpool on the morning of Christmas and it was like a dead zone. But it turned 180 degrees the next day, boxing day hahahaha… Btw do they have boxing day in the Netherlands? Penang is indeed in my come-back-list. It’s a food heaven! Ahh didnt get the chance to try a lot of food, must do it next time! Wah, kudu balik lagi ke sana buat ngunjungin The Blue Mansion nya… cakep banget yah..
eh tapi hiasan CNY nya juga unik buat masuk dalam album kunjungan. Labuan Bajo is in my come back list, believe it or not😆 Banyak tempat yg blom dikunjungi soalnya. I’ve never been to Penang, maybe should put Penang in my bucket list too. Ahh I’ve never been to Labuan Bajo Ri.. definitely in my bucket list! tukeran gitu kita 😉 Iyaa terselamatkan oleh restoran India.. no complaints at all hehehe. btw aku baru liat header kamuuuu, keceee! Yaahh pemilu2 tutup ya, kirain buka siang gitu.. terus kesampean balik lagi ngga? Oyaa, wah, kenapa tuh ngga boleh foto, kamu tau nggak? belum pernah kesini hehehe.. jadi tertarik nick karena baca beberapa tulisanmu mengenai penang. Previous Previous post: Growing.. old?